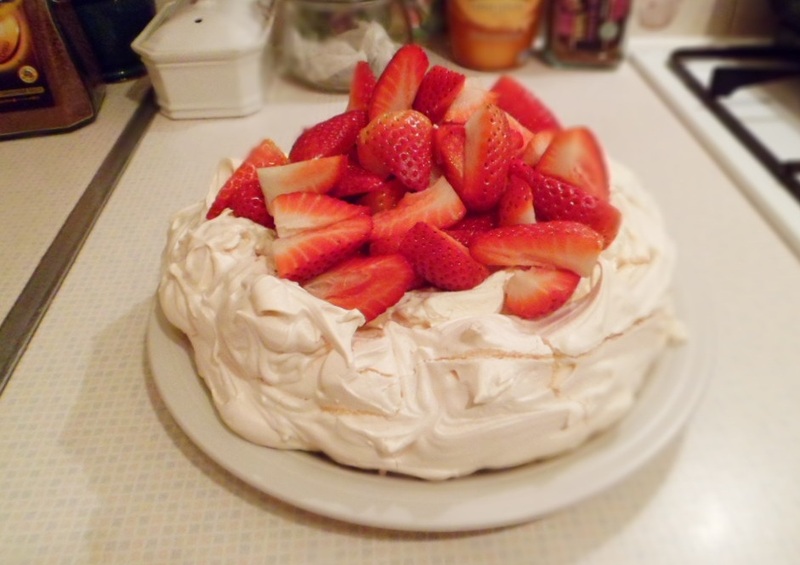 Now if someone asked me what my favourite pudding was, it would be Strawberry Pavlova every time. It's perfectly summery and really tasty! Strawberries have always been one of my favourite fruit so I love nearly anything with them in and the crunchy meringue complements the softness of the cream and fruit. This was my first time at making meringue and was really happy at how it turned out. I'd always thought of meringue as a bit of challenge when people talk about "Stiff peaks" but now I love making it and am going to make a Lemon Meringue Pie for my Auntie at the weekend (post to follow!) And did you know that this pudding is originally from New Zealand- me neither! This recipe is from my Mum's trusty Delia Smith's Complete Cookery Course. Preheat the oven to 150oC/300oF/Gas Mark 2. Line a baking sheet with greaseproof paper and grease lightly with oil/butter/margarine. Place the egg whites in a clean bowl and whisk until soft peaks form. This will be when the mixture looks like it has little mountains in it. Start to whisk in the sugar, a little at a time until all the sugar is combined. By now the peaks will have become stiffer- when you tip the mixer upright, they should stand up. Spoon the meringue mixture onto the baking sheet forming a circle with a little dip in the middle. (This will be where the fruit sits) To make the meringue look decorative, you can take a skewer or fork and create swirls and peaks around the edge. Place the baking sheet in the oven and immediately turn it down to 140oC/275oF/Gas Mark 1 and leave to cook for an hour. After an hour turn the oven of but keep the meringue inside until the oven has completely cooled. This is to allow the meringue to completely dry out and can take from 2 hours. When the meringue is ready, gently peel it off the baking paper and put it onto the serving dish. In a bowl whip up the cream- personally I like it quite thick. Spread the cream onto the meringue and arrange the strawberries on top. Serve with a little icing sugar on top. 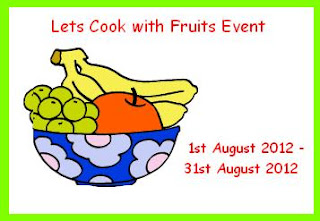 I am entering this into my first Blog Event- Simple and In Season by Ren at Fabulicious Food. 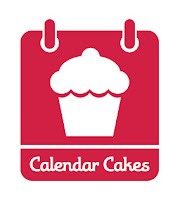 I am also entering this into Calendar Cakes by Dolly Bakes and Laura Loves Cakes because it's the perfect summer pudding! P.S Earlier on in August I went to the Bristol Hot Air Balloon Fiesta with my friend Sarah. (She also appears in Pretty Pink Wedding Cake) We saw some amazing sights but we particularly like the Churchill one! What a lovely high pavlova, you must have really given it a good beating! I'm Back... and So's the GBBO!